Welcome to day one of 30 Days of Writing II minus 2. Now of course someone that runs a blog called We Work For Cheese would of course begin our little challenge with the prompt of "cheesy". But I ask you, how cheesy is that, right? I love cheese. Sliced cheese, gourmet cheese, cheese sticks, pepperoni and cheese pizza, cheez whiz...you name it, I'll pretty much eat it. 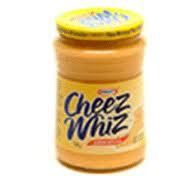 When I was a kid I pretty much lived on Cheez Whiz sandwiches. There was nothing quite like cold, refrigerated globs of Cheez Whiz on fresh white bread. Mmmm-mm. Or on crackers. And I'd wash it all down with a couple of glasses of chocolate milk. Also when I was a kid one of my favourite expressions was "Who cut the cheese?" and "He who smelt it dealt it!" I haven't eaten Cheez Whiz in years. You see I've matured, just like the cheese I now eat. I love brie, edam, swiss, cheddar and many other kinds of cheese. Stilton? Forget it. I just can't stomach the stuff. But I pretty much like the rest as long as it's not too exotic. Funny, you know, I may have given up Cheez Whiz but as I've grown older people increasingly ask me, "Who cut the cheese?" Trot on over to Nicky and Mike at We Work For Cheese and check out the linky dinky thingy to see who else is cutting the cheese today. :) around Philly (where I live) cheese whiz is alive and well.... (so to speak)- it is the "authentic" cheese for our famous Philly cheese steaks... when ordering you should say "regular steak with whiz"
You know Dufus, I am SO happy we don't have Cheez Whiz over here. That said, I respect your opinion and won't mock you shamelessly for liking cheese so much. You're welcome, my friend. I've not eaten cheese whiz since I was a kid, either. It is fortunate how our tastes change over the years. I love cheese, too, but I'm with you on some of the more pungent ones. Cheez Whiz is awesome. I still think it's great. When in Philly, I get my cheese steak "wit Whiz," which affectionately means I want it with onions and cheese whiz. Sinful. Now I'm craving some Cheez Whiz. We used to eat the spray kind right out of the can. Tasted pretty good as I recall, even though it was probably made from Vaseline colored with Cheetos' dust. Oh I love Philly Cheese Steak sandwiches. Haven't had one in ages. Now I've got a hankering for one. Um, that's okay Nicky. You keep it. Hey I like more than cheese. Just not vegetables or liver...with or without cheese. Yeah, I'm a mild cheese kinda guy. The sharp ones just aren't for me. I didn't realize cheese steak came with Cheez-Whiz. I mean it's not even real cheese, is it? Yeah, Barb beat you to it. But seems you two have something in common. I used to melt it over soda crackers...back before we had such thing as nachos. If you are going to get something already unhealthy, why not go the distance? Ha, ha, is that what it was? Never had the spray kind. Yuck. But I do recall little kind of plastic sausages of cheese that you used to squeeze out onto bread and crackers. Remember that? I never had Cheez Whiz as a kid, but being the good mother that I am naturally let my daughter buy and spray the stuff right into her mouth! I don't recall this spray cheese stuff. I did have a hankering for spraying Reddi-Whip in a can in my mouth though. Do you remember the squeeze tubes of cheese they used to sell at Steinberg's? Yeah, yeah, I think that's what I'm thinking of. My mom used to buy them. They didn't last long. "Cheez Whiz on fresh white bread" holy COW... heart attack on a plate... but thinking of that cold... I bet it was good. During one of my pregnancies I was addicted to cheez whiz on ritz crackers. And boy was it bad when someone attempted to eat my pregnant cheez whiz! Yeah, things have changed. No more Cheez-Whiz, no more white bread. Sigh. I always wondered about who named Cheez Whiz and why it was named that. Personally, I don't think food products should have the name whiz. All these people ordering cheese steaks with whiz are just asking for it. You make a good point, Malisa. One I hadn't thought of. I kinda wish you hadn't mentioned it now that I think about it. Cheez Whiz strikes me as pretty gross, but I love that plastic cheese they give you with nachos at the movies. I'm pretty sure that's just heated Cheez Whiz. It's been years since I last ate Cheez Whiz, but I guarantee you that if I ate some today, I would still love it just as much as I did back when I was a kid. The odd thing about that "Who cut the cheese?" line is that it's kind of a juvenile thing to say, but a lot of kids wouldn't really get the joke because they don't generally eat smelly cheeses. I've never been a fan of Cheez Whiz (isn't it like two molecules away from liquid plastic? hee hee). However, I went through a phase where I used the term Cheeze Whiz as an expletive. Sounded sweeter than an f-bomb, or saltier than an f-bomb. HA! I'm glad you've matured enough and outgrown cheeze whiz. Seriously, it would give me the heebeejeebies to think of you eating it and ENJOYING it. Ah, the good old days, eh, when juveniles said juvenile things. By the way is your fridge running? You better hurry and catch it! You know all this talk of Cheez Whiz and I kinda have a hankering for the stuff. I used to pile it in the curve of celery sticks too. Yum. I love almost all things cheese. But Cheez Whiz = GAGS! Heh, heh. It's not cheese. It's a "processed cheese food". Wikipedia says of that term: These products contain regular cheese that has been reprocessed along with additional ingredients such as emulsifiers and stabilizing agents, such as xanthan gum or carrageenan. I know. I think it's better not to know.